Language integrated query (LINQ) in .NET 3.5 provides querying capabilities to Object Oriented programming languages like C# or VB.NET. This integration of querying capabilities allows compile time checking of query expressions as well as intellisence support from IDE's using the reflection. Linq allows the developer to write query expressions in his own choice of programming language with out having the necessity to learn different databases and query languages. Linq defines a set of standard query operators to perform SQL operations over the different data sources. Linq architecture is extensible. Linq includes extensions that provides querying capabilities over different data sources. Linq to Objects: This provides the ability to query IEnumerable<T>-based information sources which include arrays, collections, list of objects. Linq to XML: This provides efficient, easy-to-use, in-memory XML manipulation capabilities to provide XPath/XQuery functionality to the programming languages using simple query operators. Linq to SQL: This gives the ability to access relational data base objects as normal .Net objects. LINQ to SQL integrates SQL based schema definitions to the common language runtime (CLR) type system. This provides strong typing, syntax checking, intellisense over SQL objects, while retaining the expressive power of the relational model and the performance of query evaluation directly in the underlying database. Linq to DataSet: Provides the ability to query ADO.NET Dataset. Linq to Entities: Provides the querying capabilities over ADO.NET entities. In the above query from operator used like foreach keyword, where operator used for conditional selection (restriction) and select is used as projection operator to select the fields from the array. These are called Standard Query Operators. The query returns an IEnumerable<T> which references to an in-memory object whose CLR type contains an array of integers, whose values are less than 5. These CLR types are called anonymous types because they don't have a type name. The lownums variable declared by var keyword. The var keyword is used to declare implicitly typed local variables. These variables type is implicitly derived from the object types these variables assigned to. The same syntax is used when we are querying over objects. A simple query which used to retrieve objects based on a condition is shown below. The above query uses where keyword to find all products that are in stock and cost more than 20.00 per unit. The variable products represents strongly typed list of product objects which are initialized from GetProductList() method. The variable expensiveInStockProducts is the type of IEnumerable<product> which references to collection of objects of an anonymous type which is type equivalent to Product type. Because the Select operator projecting the complete product object itself. The products in the expensiveInStockProducts are added to an ArrayList object list, which is used as the datasource for the GridView object on the aspx page. The AutoGenerateColumns property of the GridView set to True, because of this this the GridView can dynamically generate the column names obtained as the result of the query. Now the GridView showing all the fields of the Product type this is because the select operator projected complete Product object itself. Using Select Operator to Project individual fields. 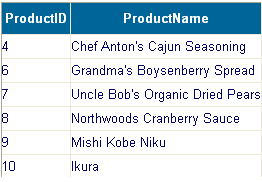 ProductID, ProductName fields of product object. These two fields are represented as string fields because both are declared as strings as part of the Product type definition. Here we are explicitly using the new keyword to dynamically create an anonymous type. This is mandatory because the select operator is projecting a new type definition. Now the GridView looks like below with only two columns. 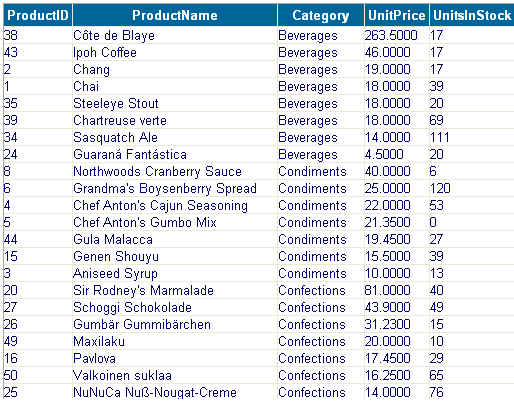 In the above query the UnitPrice field is renamed with Price. And the generated type will have Price as the field name instead of UnitPrice as below. The sorting functionality is achieved by using the orderby opertaor. 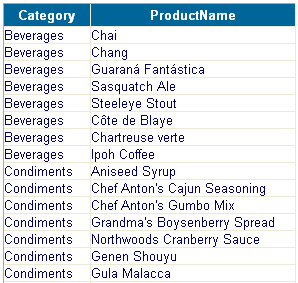 The below query outputs the products ordered by the product name field. The sorting can be ascending or descending. By default the sorting will be ascending on the field name specified by orderby operator. If we want to order them in descending order we need to explicitly use the descending keyword followed by the field name on which we want to apply the ordering. We can apply a compound sort means the sort will be applied on multiple field from left to right. A simple query using compound sorting is shown below. 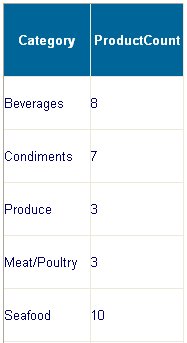 The above query orders the products by category first, after that the results will be sorted by UnitPrice in descending order like below. As like sql we can group the objects using the 'group by' operator in Linq. A simple query which demonstrates grouping is shown below. The output of the query orderGroups becomes an enumeration of groups (IEnumerable<IGrouping<string, Product>>). Each item of this enumeration defines a group (IGrouping<string, Product>). As in its definition, IGrouping is defined as the combination of the key of the group (p.Category) and the products grouped by this common key. To retrieve these items, we have to enumerate through the group as shown above in the comments. Normally we will use grouping to get the group count or group max, min of the items. We can get the group count as below. But if we want to use Max, Min operators on the grouped objects the grouped objects must implement the IComparable inorder to do comparision. For simplicity the same query can be written using into operator with out using the nested query as shown below. The output of the above query looks like below. The Distinct operator is used to eliminate duplicate elements from a sequence. The output of the query gives an enumerable object and which can be enumerated to get unique categories. The Union operator is used to combine the objects of two collections, but the output contains only distinct objects from both the collections. The Intersect operator is used to find the objects which are common in both the collections and outputs the same. The Except operator is used to find the objects that are present in the first collection but not present in the second collection. An example which shows these three operators usage is shown below.